Have you ever gone clothes shopping and find yourself standing in the middle of a store in utter confusion? What the heck should I buy? Everything looks nice! I’ve done it. Especially in stores like Banana Republic, J Crew and Express. Their selection is amazing. For the fashion illiterate (like me), the huge selection makes for a difficult time deciding what shirts go with what ties. And what sweaters go with what pants. So I often look for inspiration throughout the stores – usually by checking out the stylish mannequins. But with that said, I am beginning to see a trend. The wardrobes on the mannequins are usually sold out. And not just one or two items. 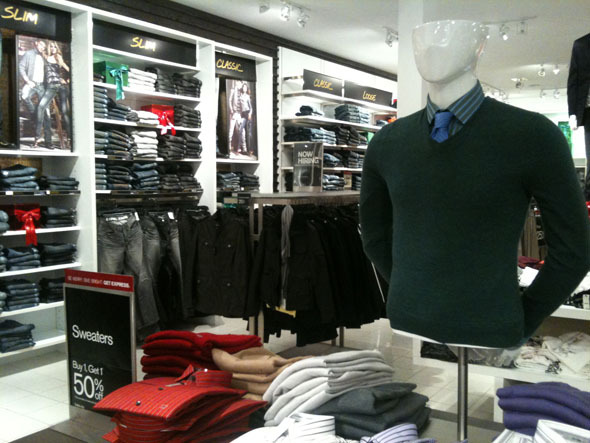 Almost every time I see a well-dressed mannequin in a store, all of the pieces are unavailable. It tells us that if retail store managers are serious about moving product. They must be aware of what is available in their inventory in comparison to the mannequins. If they are displaying a wardrobe that is no longer available, they’ll clearly not achieve their revenue goals. What do you think? Have you noticed this trend in your favorite stores?